Need a hearing loop installed correctly? You have come to the right place! We have a vast knowledgebase and extensive experience installing hearing loops. Professional layout, equipment, and installation ensures your hearing loop will function properly for years to come. 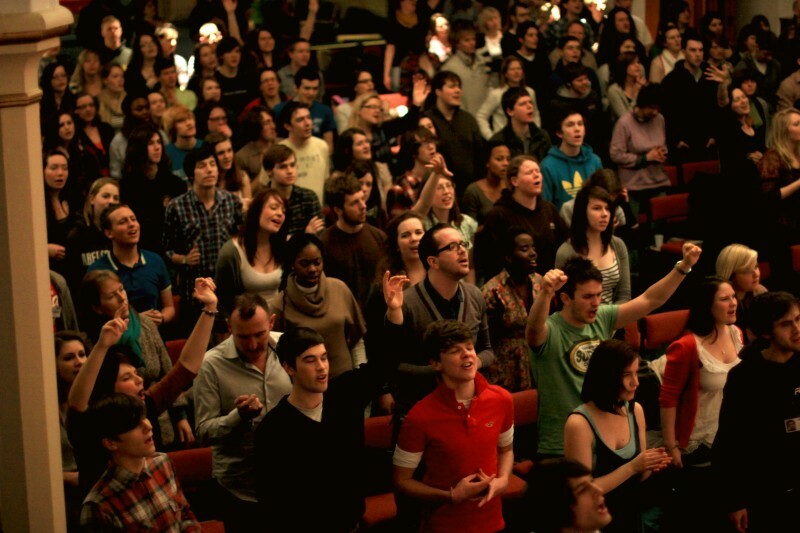 Want your congregation to hear you? We install hearing loops in churches and houses of worship. Performing arts, little theaters, and playhouses are perfect for hearing loops! Hearing Loops are perfect for Retirement Communities! Everyone can hear all the activity. Hearing loops help your hearing impaired attendees hear everything at the meeting. All Hearing Loops are NOT the same! Educate yourself and know about all the possible issues that can arise by selecting the wrong installer. 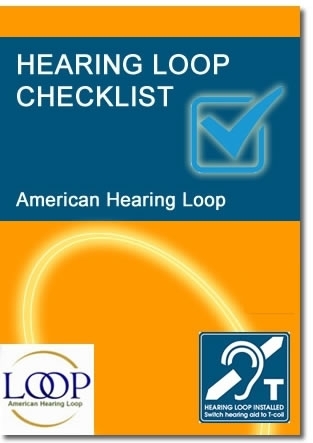 To download the checklist, Things to know before purchasing a hearing loop, click here. An estimated 61 million people in the U.S. are hearing impaired. Put another way, one out of every 10 of us have hearing loss that affect our ability to enjoy films, lectures and other public presentations or decipher public announcements at places such as airports and sports stadiums. Hearing aids improve a person’s ability to hear in quiet locations, but they can’t filter out background noise and reverberation in public places. The more the wearer increases the volume of the hearing aid, the higher the level of background noise. An announcement on a public address system is often incomprehensible. Increasingly, a hearing loop is being embraced as a solution to the problem. 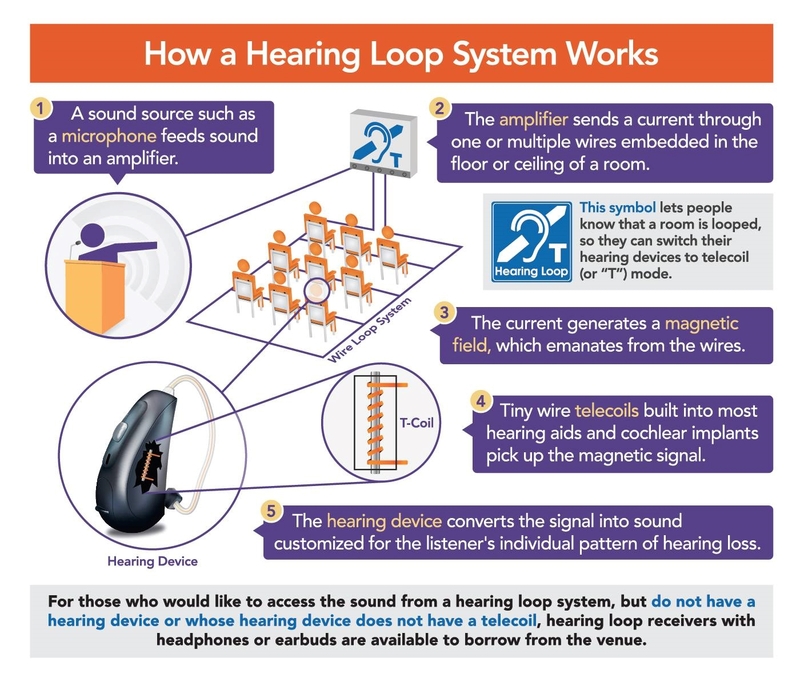 The Hearing Loss Association of America and the American Academy of Audiology are leading the charge with a “Get in the Hearing Loop” education campaign. American Hearing Loop is pleased to be one of the few certified installers of hearing loops in the South East. In this website, we will share information about hearing loops and answer some frequently asked questions about hearing loop installations. If you have a specific question, please don’t hesitate to contact us. Try the 2 audio clips below to hear the difference a loop can make. Listen to Kathy Kopp voice her hearing loss and how hearing loops have helped. She also urges others with hearing loss to speak up and tell others. American Hearing Loop installs loop in Magnolia Theater in Sun City, Hilton Head SC. 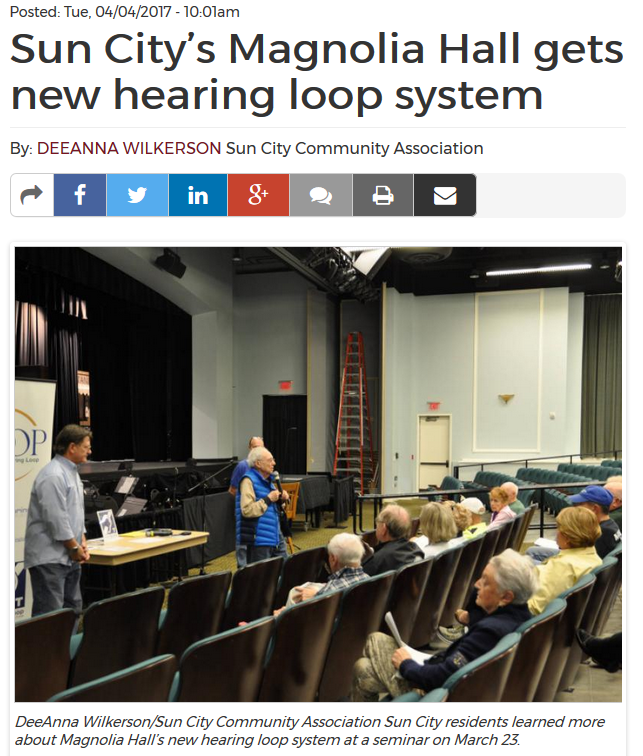 Sun City residents who rely on hearing aid devices will now experience a more fulfilling theater experience when they visit Magnolia Hall thanks to the installation of new technology. A new hearing loop system will allow residents with hearing aids equipped with a telecoil to hear more clearly during the many events that take place at the venue, from movies to live performances. American Hearing Loops co-owner James Stowell explained how the system works during a seminar March 23. 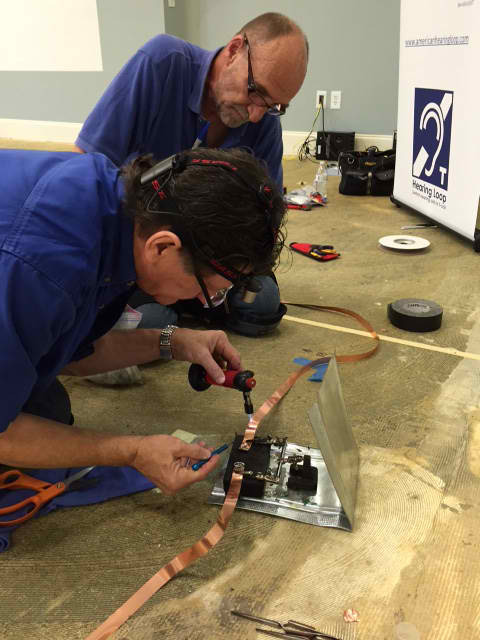 Service workers at the Lexington Chamber of Commerce in Lexington, South Carolina, install the new hearing loop that was partially paid for by the Lexington Sertoma Club, Feb. 3, 2016.